Tracy has three roads named Schulte Road. You know — if you come into town off 580 at Patterson Pass Road, then drive past the big Costco and Safeway warehouses, you are on Schulte Road, which dead-ends at Lammers Road. But if you turn right onto Lammers, just before the train tracks you can make a left turn onto … Schulte Road. If you drive to the end of that version of Schulte Road, which bottoms out at Corral Hollow Road, you can hook a quick, awkward and sometimes dangerous U-turn around the tracks, then drive a couple of blocks to the next signal light which is, of course … Schulte Road. Why wouldn’t it be? Renaming “Section 1” of Schulte over in the burgeoning warehouse district as “Promontory Parkway” sounds like a terrific choice. The City Council agenda notes “Promontory Summit, Utah, was the location of the first transcontinental railroad in the United States and therefore, of historical significance in railroad history,” and you know that we’re all for anything railroad-related around these pages. But what about that lonely, orphaned little segment of Schulte that links Lammers Road to Corral Hollow Road, running along the seldom-used Union Pacific tracks? As part of the Southern Pacific Railroad’s portion of the transcontinental line, those rails once carried numerous trains each and every day to and from the Bay Area by way of Altamont. Those rails and that section of Schulte Road, however, have an another claim to historical significance: the original town of Ellis, including a depot, engine house, freight warehouse and stock pens, were originally located right there, just a few hundred feet up Schulte from Corral Hollow. So how about renaming that section of Schulte with something that gives a nod to its place in Tracy history? Railroad Avenue. Strangely enough, for a city that was founded strictly because of the railroad, there is no “Railroad Avenue” in Tracy. Central Pacific Avenue. The town of Ellis, which was torn down in 1878, loaded on railcars and transported three miles or so down the tracks, where it became Tracy, was built by the Central Pacific Railroad, which was the predecessor of the Southern Pacific Railroad which, in turn, got swallowed up whole by today’s Union Pacific Railroad. Depot Road. Okay, not frightfully original or interesting, but if there’s a chance that “Ellis Depot Road” could be confused with the existing “Ellis Road,” then here’s a compromise solution. Of course, there is the oddly-named “Depot Master Drive” over off of Linne Road … but that shouldn’t be a huge problem. Any other ideas? Let us know or, better yet, let the Tracy City Council know. EPILOGUE: What was the city’s final decision? On October 16, 2018, the Tracy City Council voted to authorize renaming the short, disconnected stretch of Schulte Road to Western Pacific Way. A plat map of the railroad depot at the old town of Ellis (1869-1878), courtesy of Pete Mitracos and the Tracy Historical Museum. FEATURED IMAGES: At the top of this article, a recent photo of the old Southern Pacific tracks along Schulte Road at the Corral Hollow Road intersection. The Central Pacific Railroad built a depot and coaling station here, but relocated the entire facility to Tracy in 1878, after only a few homes had been built. 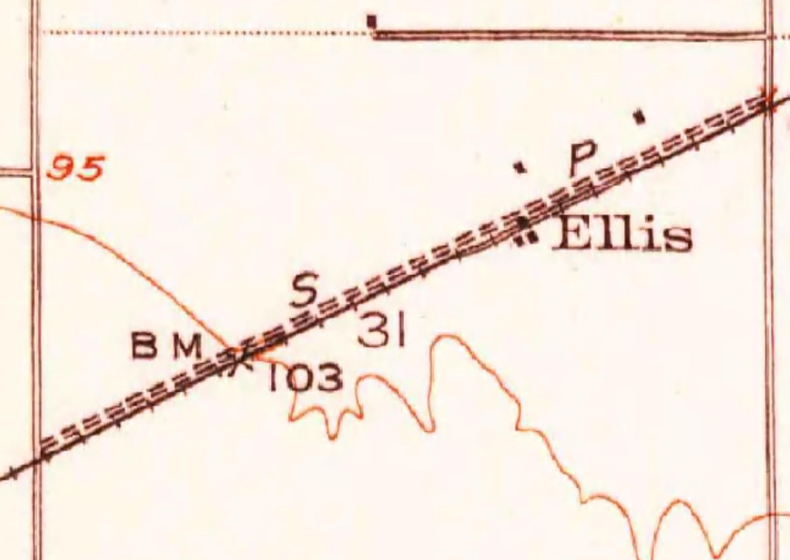 The smaller inset map of Ellis is an excerpt from a 1951 USGS map, with Lammers Road running top-to-bottom at left, and Corral Hollow Road as its bookend on the right edge of the map.